The Fair Debt Collection Practices Act (FDCPA) is a powerful law that helps protect consumers, including Alabama consumers, from abusive and harassing debt collectors. Note: This article will not have specific case references but we will reference the actual text of the FDCPA statute which is 15 U.S.C. Section 1692. You can find the code sections here at the Legal Information Institute. What is the purpose of the FDCPA? Why do we even need this law? Really bad things happen to consumers when debt collectors act in an abusive manner. And state laws are not enough to stop this (1692(b)) — this is certainly true in Alabama where we have little in the way of state laws to help stop abusive debt collectors. Finally, not only was the FDCPA passed and signed into law to protect consumers, but also debt collectors. Section 1692e tells us that the debt collectors that follow the law will be at a competitive disadvantage. Why? Because there are abusive collectors breaking the law — that gives an unfair advantage over the honorable debt collectors. I once mentioned to a jury in closing argument that the honorable law-abiding debt collectors are like a football team that has 11 players and follows the rules. But the cheating — abusive debt collectors are like a football team with 13 players who break the rules. It is not fair and the way to stop this is to punish the cheaters so they will play by the rules. Basically two ways someone can be a debt collector. First, their primary purpose or function is to collect debts. This would be a debt buyer who buys debt in order to collect on it. Second, they collect debts owed to other companies — this would be like a traditional collection agency. Basically, the debt has to be in default when it is received by the company that the consumer claims is a debt collector. This would exclude the original creditor. Note: this can become complicated with various exceptions but the above is a good starting point. A natural person is a human being. The next part is critical — “obligated or allegedly obligated” to pay a debt. So if you actually owe the debt, then you are a consumer. But what if you do NOT owe the debt and the debt collector says you owe it? Then you are a consumer. If you owe the debt, then it doesn’t matter what the collector thinks about you. You are a consumer under the FDCPA. And if the debt collector thinks you owe the debt, then it does not matter whether you do or do not owe the debt. You are a consumer protected by the FDCPA. An easier way to look at it is what is not covered? Business-related expenses. So most likely spending money on a business trip will not be considered a “debt” under the FDCPA. A house bought for investment purposes will not qualify. Business — most likely not covered. Non-business — most likely covered by the FDCPA. 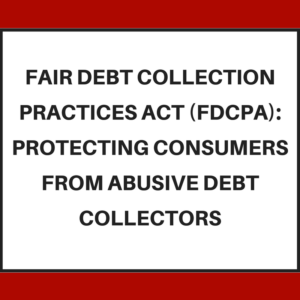 The FDCPA prohibits debt collectors from collecting debts in an abusive/harassing manner. In a deceptive manner. Or in an unfair manner. Section 1692c forbids certain types of contact — when the collector knows it is inconvenient (think shift worker sleeping in day), to a represented consumer (collector should contact the lawyer), or after a cease & desist letter. Pretty common sense — be a good person — but abusive collection is so widespread that Congress had to put this in the law books to explain to collectors to act right. So basically the letter needs to tell you about the debt and about your rights to get more information or to dispute the debt. You can be sued in the county where you signed the debt or where you live. Now if this is a foreclosure, etc. involving real property, then naturally the suit is in the county where the property is located. The reason for 1692i is to force the collector to be fair to you in the location of the lawsuit. It is unfair to sue you 300 miles away from where you lived or where the contract was signed. So if you signed a contract in Baldwin County, and you live in Mobile County, it is a violation of the FDCPA to sue you in Madison County. Here are some typical examples of illegal credit reporting by collectors. The simple rule is to look at any and all credit reporting by a debt collector. Is it true or false? Correct or incorrect? If it is false, then this will almost certainly be an FDCPA violation. Collection calls often violate the law. Let’s look at some examples. Calling third parties (i.e. not you or your spouse) and talking to them about you or the debt. Only exception is to get location information — home phone, home address, and place of employment. You get the idea — when it is abusive or lying or unfair — then it almost certainly violates the FDCPA. Being unfair — for example, it is dated July 15 and only gives you until July 17 to pay and you receive it on July 19. As with other examples, always look at the letter and see if it is true? Is it accurate? The letter harassing or unfair in any way? You can be sued when you do not owe any money. Or you are sued for more than the amount you supposedly owe. The collector (debt buyer) can sue with no intention of proving its case but just trying to get a default judgment from you. When you win your case, the debt buyer can be credit reporting even though you have proved you owe the debt collector nothing. We also sometimes see debt buyers suing you in the wrong county. Under Section 1692i you can only be sued in the county where you signed the contract or you live. Often collectors will sue you in a different county to discourage you from responding to the lawsuit. There are many ways the collectors and debt buyers dream up to violate the law — you simply examine each act and see if it was abusive/harassing, deceptive, or unfair. A cease and desist letter is a letter telling the collector you are not willing to pay and/or to not contact you again. The advantage is the collector will no longer contact you about this debt (other than exceptions listed above). So if you don’t want to talk to the collector, the cease and desist letter can be helpful. If you are dealing with an abusive collector, let them break the law so you can sue them under the FDCPA rather than having to deal with an endless stream of collectors. If you do send the cease and desist letter, do it by certified mail so you can prove the collector received it. What do you do if the collector continues to contact you after a cease and desist letter? You sue under the FDCPA. You get a number of benefits. First, you stop abusive debt collection. Second, you can recover statutory damages of up to $1,000 even if you were not harmed by the abusive debt collector. Third, you can receive money damages for “compensatory” damages. These are to compensate you for any economic loss. This could be that you lost your job because of the collector) or you paid a higher interest rate because of false credit reporting, etc. And you can receive damages for emotional distress — mental anguish. Fourth, you can have your lawyers receive attorneys fees paid for by the abusive debt collector. You have done the first step which is to learn about your rights. Now you need to take action if you are dealing with an abusive debt collector. Call us at 205-879-2447 and we will be happy to go over your options including suing the abusive debt collector under the FDCPA and under Alabama state law. (Or you can fill out this form and we’ll get right back with you).